SeekDroid, a cost-effective solution to finding lost or stolen Android devices and ensuring the safety and security of any and all information within. GT Media LLC – a Dallas-based mobile app development company founded by two SMU senior computer engineering students – developed SeekDroid as an online locator and protector of lost or stolen Android devices. 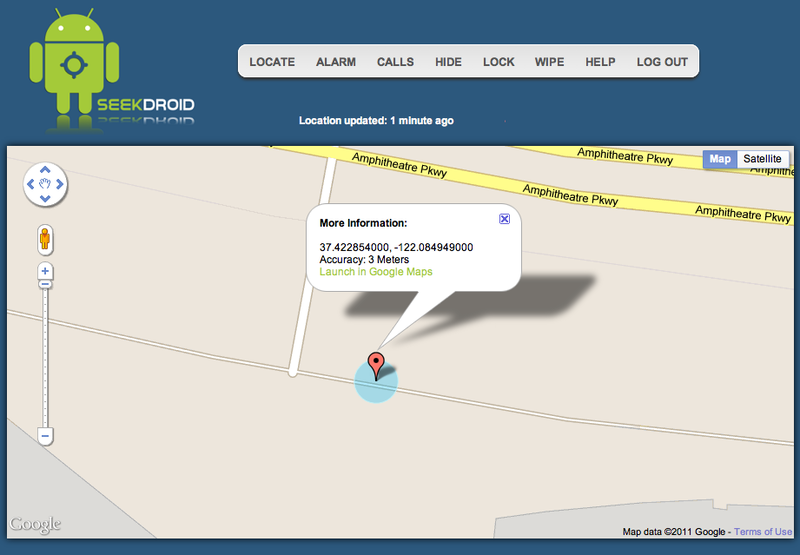 SeekDroid, which requires Android 2.2 or greater and a data connection, allows users to remotely enable GPS in order to determine the location of a lost or stolen Android. SeekDroid also allows users to remotely – from anywhere in the world, locate the device, enable an audible alarm (even if device is in silent mode), lock the device with a custom code, and retrieve recent phone calls. Available at Android Market (Tools category) for $0.99 USD, SeekDroid features a secure website, seekdroid.com, which users can access from a computer or smart phone. The website enables users to pinpoint the location of their lost or stolen Android on a map and then choose the next step toward recovery and/or protection. The ability to wipe the device from a remote location provides an effective means of ensuring that users can protect their sensitive data even in the event of a lost or stolen device. Features also include an audible alarm with customizable messages. Users may also disable the removal of SeekDroid or hide it from the app drawer to further ensure safety and security in the event of a lost or stolen phone. SeekDroid is easily installed, works without a SIM card, and uses virtually no battery since it does not need to stay running in the background. Since launching in Dec. of 2010, SeekDroid (currently Top 25 in the Android Market’s ‘paid tools’ category) has secured more than 13,000 downloads and an average 4.7 (out of 5) rating from the 516 users who have rated the product. For more information and to view screenshots and video, go to the Android Market. GT Media LLC, a Dallas-based computer engineering firm and mobile application development company, was founded and is operated by two Southern Methodist University senior computer engineering students. Creators of the popular SeekDroid mobile application (a locator and protector of lost or stolen Android devices), GT Media has established its presence in the market for meaningful, cost-efficient mobile applications that work to improve, empower, and enhance user control and security.